You’re back from the holidays and you’re ready to spread love like Take 6. You want to support local businesses because charity begins at home BUT, you remember, so do bedbugs. With this in mind you want to be careful where you spend your hard-judging dollar. 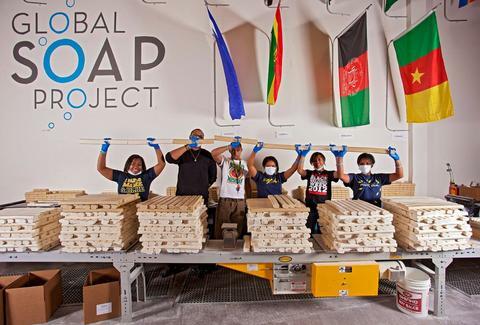 Well, ATL’s got lots of people doing good in the 'hood, from social entrepreneurship to companies that give back in cool, unexpected ways. Don’t hate -- let the dollar circulate... and use this list to get started right now. Derreck Kayongo came to America as a refugee from Uganda, and he’s gone on to not only become CEO of Atlanta’s Center for Civil and Human Rights, but also the founder of this amazing ATL-based charity that takes the unused soap from hotels -- which basically gets thrown away -- and has it put through a process that sanitizes it and repackages it for those who need soap in Africa and around the world. Started by Morehouse and Georgia Tech alum Dr. Paul Judge, Luma is basically Wi-Fi that works like Surround Sound in your home, expanding the signal so you don’t have dead zones that slow down all that streaming you do. You get three little hexagon shaped Luma devices that act like separate routers, which will locate and work around Wi-Fi-blocking obstacles in your crib you after you’ve configured it through their app. Judge is already a very successful technology entrepreneur, having created Purewire and several other tech companies that have been acquired by major VC firms. He’s among a very small amount people in Atlanta who has shown willingness to give local startups the seed money they need. TechSquare Labs, the innovation hub Judge also cofounded in Midtown, is throwing a $100K startup battle in April, and they host recurring events and meetups such as “Women Who Code” lectures and more. He’s even known to hold marathon coding sessions with Morehouse students at his home from time to time. 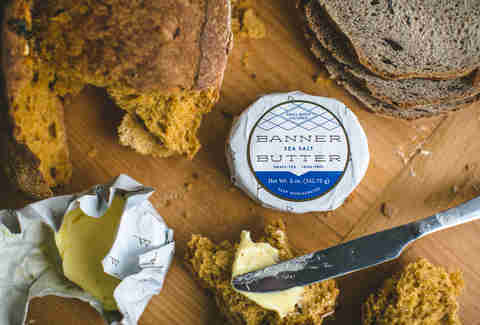 Banner is like a Hulk smash of creamy, buttery tastiness all in your mouthpiece. Made with hormone-free, slow-cultured cream from grass-fed cows, the product comes in simple flavors like sea salt as well as gourmet options like cinnamon/cardamom/ginger, and a balsamic fig with caramelized onion. It’s amazing and filled with healthy stuff like conjugated linoleic acids, vitamin E, beta-carotene, and omega-3 fatty acids. It’s also cool to know that even though Banner’s more expensive than Country Crock, you’ll live longer and plus they’re investing in local businesses, since they source milk from Southern Swiss Dairy Farm in Waynesboro, Georgia, and cream from AtlantaFresh Creamery. Just eat it in six weeks or less -- this ain’t that other stuff that’s made to live in your fridge forever. Look, we told you before all the other food magazines that it was the best new restaurant in ATL back in 2015. If you're unfamiliar, Staplehouse was the brainchild of Chef Ryan Hidinger, a Muss & Turner’s alum who ran a supper club with his wife Jennifer before he passed from cancer three years ago. Staplehouse stands as a monument to him and his vision to launch the philanthropic organization known as The Giving Kitchen. And FYI, The Giving Kitchen is basically a safety net for food service employees, who are traditionally not classified as full-time employees, and therefore don’t usually have great health benefits or the kind of savings that could serve as an emergency fund. You’ll get deep discounts on clothing, furniture, household goods and more -- think Goodwill and Salvation Army prices -- except that CareMart’s stuff is always brand new. As you’re enjoying the savings and the ability to look rich on a budget, you can also dap yourself for letting your cash turn into proceeds that benefit Caring For Others, Inc., an org whose mission is to “eradicate poverty through feeding, educating, clothing, and housing individuals and families around the world." They also distribute lots of food, and some of those new articles of clothing, toys, shoes, furniture, and more both here in the States and throughout the world. This Old 4th Ward restaurant, located not far from a lot of places where you’re probably already donating money to keep yourself well-beered (nothing wrong with that, FYI), serves nutritious meals to ATL’s homeless during the week. On Sundays at 10am they open up to the public, and volunteers prepare serious comfort food brunch including chicken and waffles, breakfast poutine, and veggie plates. The money goes to the Samaritan House of Atlanta, which "helps homeless men and women achieve self-sufficiency through personalized employment readiness and life stabilization programs.” You’ll feel good in more ways than one. This non-profit coffee shop may be in Clarkston, but that’s a short drive to make your money and buzz go a long way towards local job creation. 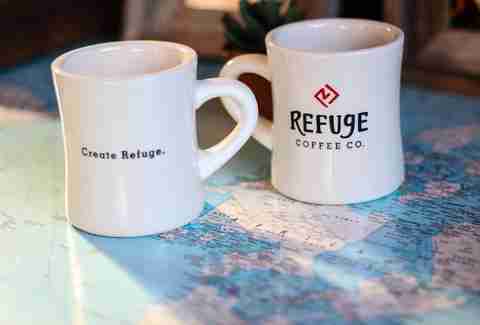 Started as a food truck, Refuge was created to train and employ refugees as baristas. They also need your help. The owner is in the middle of a foreclosure and is just $20K away from raising the $75K they need to keep going. Drink more coffee and support the fundraiser! Addressing South Atlanta’s food desert situation on a grassroots level is challenging. Big chains like Publix aren’t in a rush to serve lower-income communities since they usually don’t have the spending power to support and sustain such a grocery store. Still, folks spend lots of money on food in these areas, so FCS Urban Ministries started Carver on Jonesboro Rd to establish an oasis of affordable and healthy edibles. They sell locally grown produce from places like Atlanta Harvest, an urban farm started on the land formerly used by the General Motors plant, which is less than a mile from the market, and they also employ folks who live in the neighborhood. 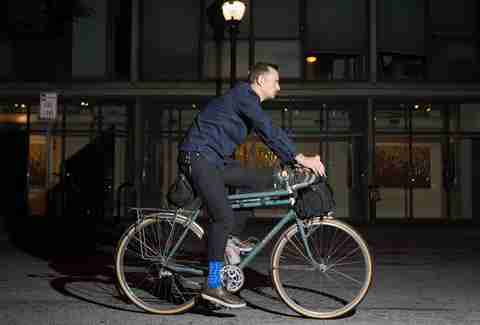 This local apparel retailer makes durable clothing -- and provides commuter apparel reviews, which you didn’t know you needed -- for cyclists in need of gear that will survive the daily transport. Everything Spindle makes -- shirts, pants, shoes, and bags -- is field-tested to make sure it'll last. They also want us to say “we're not talking tights here folks,” so yes, you can wear this stuff on a date with a fellow bike nerd and seem at least somewhat-trustworthy. They’ve even hosted community rides, including last November’s “Burrito Armageddon” and “Refugee Relief,” in which they collected clothing for those in need. Mike Jordan wants you to put your money where your mouth, body, and spirit already live -- here in ATL. Hit him up on Twitter at @michaelbjordan, or Instagram him at @mikejordanatl.